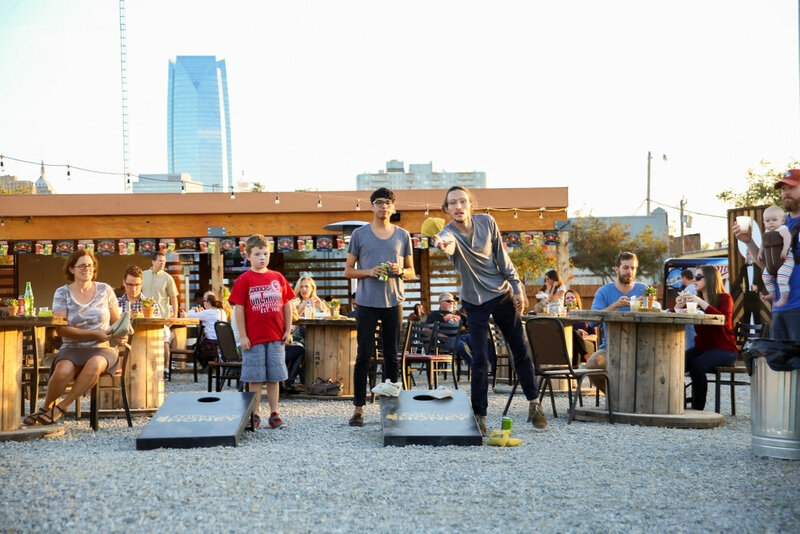 The concept of The Bleu Garten can be found in its name. The French word bleu is associated with one of the most influential culinary academies in the world. Le Cordon Bleu, translated "Blue Ribbon", is thought of as a term to describe excellence in the kitchen. We use the German word garten because we modeled our ambiance after some of the cleanest and entertaining bier gartens in America, to give the consumer an outdoor dining experience that is completely unique compared to anywhere else in Oklahoma. Many food trucks' concepts are fusions of clashing cooking techniques. The end result is innovative deliciousness! Our name is tied into the concept of fusion with not only the food trucks, but with the fusion of the renaissance culture that is beginning to sweep Oklahoma. Our goal is to not only provide a venue where food trucks can be hired as independent contractors to serve customers, but also to provide a venue where their customers will be provided clean restrooms, alcohol, shaded seating, misters, heaters, light music and theater entertainment - a combination of luxury that no food truck in Oklahoma has been able to acquire and few food truck parks in the nation provide. Our overall goal is layered, we want to not only let our venue grow successfully but provide a place where entrepreneurs can grow and mature their products. We pinky swear to respect your privacy. Click our Instagram photos below for updates on openings, food trucks & specials! Want to send someone a GIFT CARD to enjoy their gartening experience on you?! Bleu Garten gift cards are redeemable at any of our onsite bars, however cannot be used at any food trucks. click the logos to find out more about each truck! Do you want to bring your food truck to the Bleu Garten? Please be patient, as we receive lots of applications each week. We respond to food truck applications Tuesday thru Thursday during regular on-season months. If you are submitting during our off-season winter months, we will get back with you in February regarding booking. You will receive an e-mail from docs@bleugarten.com so make sure you check your junk folder! -Certificate of Insurance showing us as an Additional Insured. We must receive an official copy from your Insurance Provider. Yes, please fill out the request form by clicking the button below to receive specific pricing from our Private Events Coordinator. Check out our Private Events page to see ideas and photos from previous events. If yes, please explain in further detail. We do require a bar minimum for all rentals. If yes, please provide their names so we can verify that they are licensed with us. Will guest be paying for their own food & drink? * Yes No, I'll be picking up the tab! Please provide any other information that will be helpful in explaining your event! Our Events Coordinatior will be in touch with you as soon as possible. Please be aware that she responds to Private Event requests via e-mail, Tuesdays through Saturdays and it may take up to 72 hours to receive a response due to the high number of Private Event requests we receive. WHERE DO I GET THOSE STRING LIGHTS?! Thanks to JASCO, who generously donated ALL of our LED string lights this year, you can enjoy the "Gartening Glow" in your own backyard by purchasing on their website HERE. Unfortunately, due to the high demand, we are unable to take reservations. All seating is first come, first serve and seat yourself. This makes it possible for all the "Garteners" to stay as long as they'd like with us! Do you serve a full liquor menu? Yes, our "Bar Pod" is a full service liquor bar with craft beer, liquor, and wine on tap. Our domestic beer drafts along with more liquor can be found in our "Lodge" in the southwest corner of the venue. All canned domestic & craft beers are located in our "Beer Barn" in the center of the venue under the billboard. Yes, our bar has a limited non-alcoholic menu and most of the food trucks also serve non-alcoholic beverages. We also have an on-site vending machine stocked with various sodas and water. Can we bring our own food and drink to Bleu Garten? No, we have created a Food Truck hub to support local creative chefs. We require all outside food and drink to be thrown away upon entering the premises. Can we take our food and drinks from Bleu Garten to-go? You are welcome to get your food truck food to-go including any non-alcoholic drinks in bottles or cans. All alcoholic beverages and plastic cups must be thrown away before exiting the Bleu Garten. Is Bleu Garten family friendly? Yes! We pride ourselves on creating a family friendly atmosphere where families can come and enjoy each other and great food. 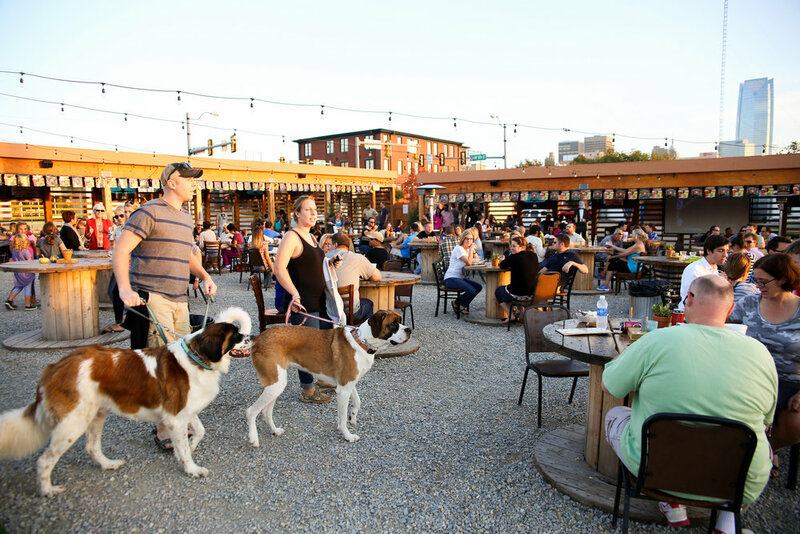 Is Bleu Garten dog friendly? Furry friends are welcome at Bleu Garten any day of the week! We do ask that you keep them on a leash with you and please clean up after your pet if any messes are made. When you bring your pet with you to Bleu Garten, you are taking full responsibility for their actions so please be considerate of others around you. How many food trucks will be at Bleu Garten today? Our schedule on the website gives a full up-to-date calendar of what trucks are scheduled to be at Bleu Garten each day. You can also stay in the know by using the Truck It app that reflects our food truck schedule or by following us on Facebook, Twitter, or Instagram where we post our schedule each day. Will Bleu Garten be open for the Winter months? Brrrrrrrr! We will be closed from December 2016 through February 2017. Check our Instagram for surprise openings as the weather warms up throughout the winter! I'm a food truck, how do I park with you? We love to have new food trucks park with us! Please fill out the application on our website and someone will get back with you shortly for more information. Please note that we require all up-to-date city and state licenses as well as active social media accounts. Looking to have your next event at The Garten? You can enjoy LIVE MUSIC for FREE from a variety of local bands. Check our calendar for details! Do you want your band to play at Bleu Garten during our LIVE MUSIC nights? Thank you! If we feel you are a fit for Bleu Garten we will be in contact with you via e-mail. wine & palette & the garten! Let's Paint & Sip! Check out Wine & Palette's calendar of events to see when the next Bleu Garten event will be held! If you want to work in a creative, fun, high-energy environment with a new growing company, we invite you to bring your enthusiasm and passion to the Bleu Garten. What makes you a great employee? Thank you for your submission! Someone will be in contact with you via e-mail within 2 weeks. If you do not hear from someone, please except our apologies, as sometimes we receive too many applicants to get back with everyone.